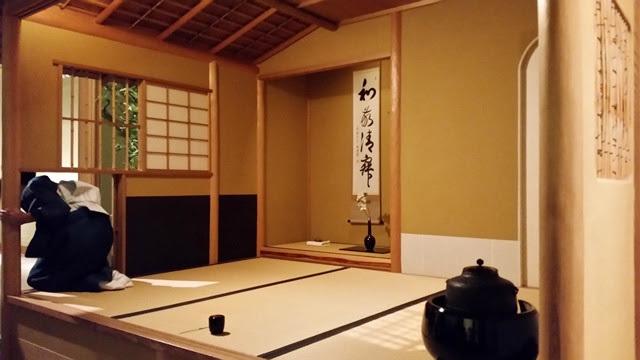 Ryokusuian Teahouse is located on the 3rd Floor of the Seattle Art Museum, just one floor up from the Ticketing Desk. Limited access tickets may be purchased by donation. Fixed price Exhibition tickets provide access to all public areas of the museum, including current exhibitions and demonstrations. On July 20th, I attended an Urasenke tea ceremony demonstration at Ryokusuian. Narration was provided by Timothy Sowa Olson, one of my former instructors at East-West Chanoyu Center. He holds the senior rank of Junkyoju within Urasenke and has a wealth of knowledge to share about chanoyu and its philosophies. The teishu (host) was Reverend Kanjin Cederman and the kyaku (guest) was Akemi Edwards. Japanese tea ceremony incorporates elements of Taoism, Confucianism, Shinto, and most especially Zen Buddhism. Upon entering the chashitsu (tea room), the guest will study and bow to the scroll and floral arrangement, then view and bow to the chagama and furo (kettle and brazier). Charcoal of specific length and diameter is laid out in carefully sculpted rice ash in the furo. At cha-kaiseki, the charcoal fire might be arranged by the host in front of the guests. In venues like the art museum where fire is prohibited, an electric furo is used. Scrolls in the tea room feature calligraphy rather than imagery to prevent distraction. Most often the calligraphy is Zen, meaning it is done by a calligrapher who isn't a professional. In this way, the focus of the calligraphy is to transfer of energy rather than simply writing, so it is often illegible even to scholars. The scroll in Ryokusuian reads, "Wakei Seijaku" which means "Harmony, Respect, Purity, Tranquility." The floral arrangement seen in tea ceremony is called chabana. It is meant to appear effortless and unconsidered, yet there are many rules to the arrangement including the height of the arrangement, the style of vase, having an odd number of blooms, and having multiple flowers appear to come from the same stem. 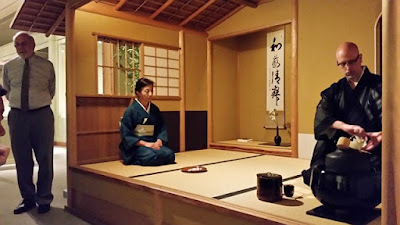 Once the guest is seated, they will invite the host to enter and they will perform aisatsu, a formal greeting. The host will then offer chagashi (tea sweets) to the guest and bring in the tea implements. 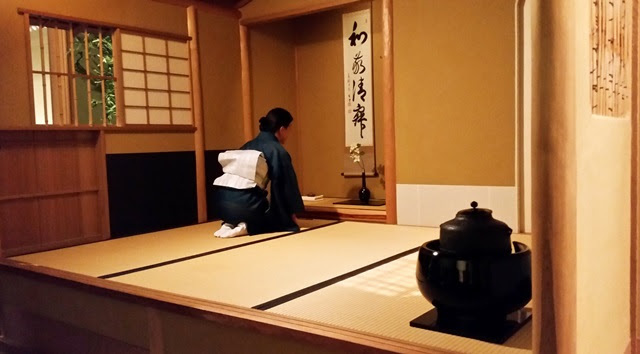 Next, the host will fold their fukusa, a silk cloth with colors and folds specific to a tea school, and clean the natsume (tea caddy) and chashaku (tea scoop). Everything is cleaned well before the tea ceremony, so these stylized movements are intended to demonstrate thoughtfulness toward the guest. The movements in handling the hishaku (ladle) are based on kyudo, Japanese archery. As the host begins to prepare the matcha, they will invite the guest to enjoy the sweets. For this tea ceremony the sweets were higashi, a dry sweet pressed into seasonal shapes. The taste of the sweet will complement the bold flavor of the matcha. After the tea is prepared, the guest will bow and thank the host, then turn the chawan two quarter-turns counter-clockwise so the front is facing the host. The tea is sipped three times with the final sip being audible. Then the guest may perform haiken, admiring the chawan's motif and craftsmanship. After turning the chawan two quarter-turns clockwise so the front faces away from the host, they will return it and ask that the tea ceremony be concluded. Generally only one bowl of matcha is prepared for a guest, but the host will prepare more matcha if the guest does not ask to conclude the ceremony. Traditional chashitsu will often have a small entryway used by the guest, called a nijiriguchi. This is the great equalizer of the tea room, instilling a sense of humility on all who enter. This was most evident during the feudal era when samurai would need to remove their weapons and armor to pass through the nijiriguchi. 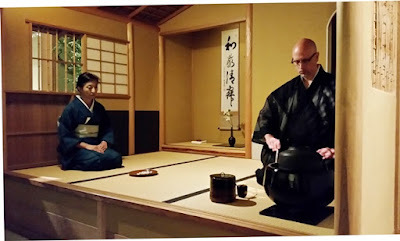 My thanks to everyone who took part in this tea ceremony demonstration! I was reminded of details I had forgotten and learned even more. 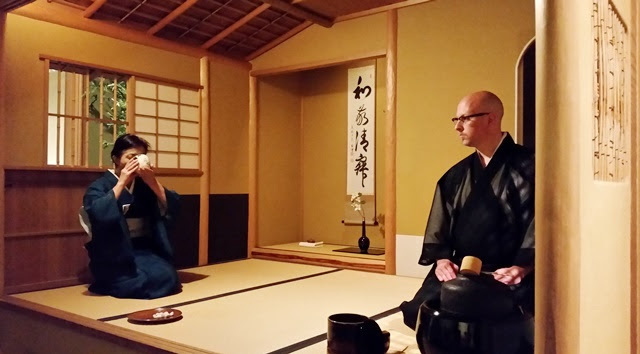 Monthly tea ceremony demonstrations at Seattle Art Museum are held on the third Thursday at 5:30pm and third Sunday at 2:30pm. There are no demonstrations in January, August, and December.